Over 800 miles (1300 km) of trails are available to hikers—anything from the easy stroll, to the grueling hikes up several park mountains, to multiple-day backpack trips. The park is best divided into 5 sections for the day-user—Yosemite Valley, Wawona/Mariposa Grove/ Glacier Point, Tuolumne Meadows, Hetch Hetchy, and Crane Flat/White Wolf. Numerous books describe park trails, and free information is available from the Park Service in Yosemite. There are also many free resources on the Internet that contain hiking recommendations and advice on Yosemite trails. Most park workers strongly encourage guests to experience portions of the park other than Yosemite Valley. Rock climbing is an important part of Yosemite. Camp 4—a walk-in campground in Yosemite Valley—has been said to be one of the most important places in the world to the history of rock climbing. Climbers can generally be spotted in the snow-free months on anything from ten-foot-high (3 m) boulders to the 3,300-foot (1 km) face of El Capitan. Classes are offered by numerous groups on rock climbing. Backpacking - Between late spring and early fall, much of the park is open to multiple-day backpack trips. All overnight trips into the back country require a wilderness permit and most require approved bear-resistant food storage. The park wilderness office can provide more information. Bicycling - Yosemite Valley contains more than 15 miles (24 km) of bike trails. Under Park Service regulations, bikes are allowed only on paved areas. Mountain biking is not allowed in Yosemite National Park. Swimming/Rafting - Generally about midsummer, the Merced River in Yosemite Valley becomes warm enough and is still deep enough to raft down substantial portions. For those who do not like the cold water, a few heated pools are available. Horseback riding - Stables are open in the summer, offering guided rides (generally by mule). Public stables are present in Yosemite Valley, Wawona, and Tuolumne Meadows. Many operations outside Yosemite ride horses into the park. Horses are allowed in many sections of the "backcountry"; however, rangers advise visitors to check with the park wilderness office for more info. Much of the park closes due to heavy snow in winter. 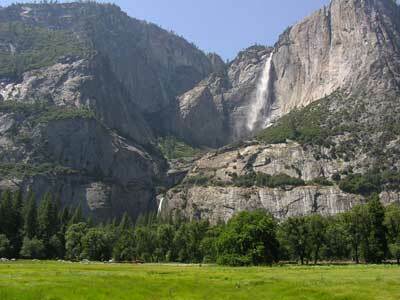 However, Yosemite Valley is open all year long. Skiing - Badger Pass Ski Area (the oldest ski area in California) opens in winter. Skiing is not up to par with Lake Tahoe or Colorado resorts, but has its own charm, being in Yosemite. There are several downhill runs and a ski school. Much of the park is open to cross-country skiing, with several backcountry ski huts open for use. Wilderness permits are required for backcountry overnight ski trips. Ice skating - The Curry Village ice rink is open between November and March. Now smaller than its historical size, the rink still offers room for the figure skaters and those with poor balance. The rink runs 2- to 3-hour sessions and cleans the ice between sessions. Bracebridge dinner - An annual holiday event, held since 1927 at The Ahwahnee hotel, inspired by Washington Irving's descriptions of Squire Bracebridge and English Christmas traditions of the 1700s in his Sketch Book. Between 1929 and 1973, the show was organized by Ansel Adams. Mariposa Grove is a sequoia grove located near Wawona, California in the southernmost part of Yosemite National Park, at 37°31' N 119°36' W. It is the largest grove of Giant Sequoias in the park, with several hundred mature examples of the tree. Two of its trees are among the fifty largest such trees in the world. Mariposa Grove was discovered by Galen Clark and Milton Mann, in 1857. They named the grove after Mariposa County, California, where the grove resides. The Giant Sequoia or Sierra Redwood (Sequoiadendron giganteum) is one of a number of species of coniferous trees known as redwoods, classified in the family Cupressaceae in the subfamily Sequoioideae together with Coast Redwood and Dawn Redwood. Giant Sequoia is the world's largest tree in terms of total volume. They grow to an average height of 70-85 m (230-280 ft) and 5-7 m (16-23 ft) in diameter. Glacier Point is a viewpoint above Yosemite Valley, in California, USA. It is located on the south wall of Yosemite Valley at an elevation of 7214 ft (2199 m), 3200 ft (975 m) above Curry Village. The point offers a fantastic view of Yosemite National Park, including Yosemite Falls, Half Dome, Vernal Falls, Nevada Falls, and Clouds Rest. Glacier Point can be reached from the Valley via Glacier Point Road. Shuttle buses require approximately 1 hour to make the trip. During the summer, Glacier Point is mobbed with tourists. The road is usually open from June through October. Access from the Badger Pass Ski Area is only by ski or snowshoe when the road is closed. Tuolumne Meadows is a gentle, dome-studded meadowy section of the Tuolumne River, in the eastern section of Yosemite National Park. Its approximate elevation is 2650m. Tuolumne Meadows has a good view of the Cathedral Range (in the background of the image, looking south), Lembert Dome and Mount Dana (to the north). Camping is available at the Tuolumne Meadows campground.